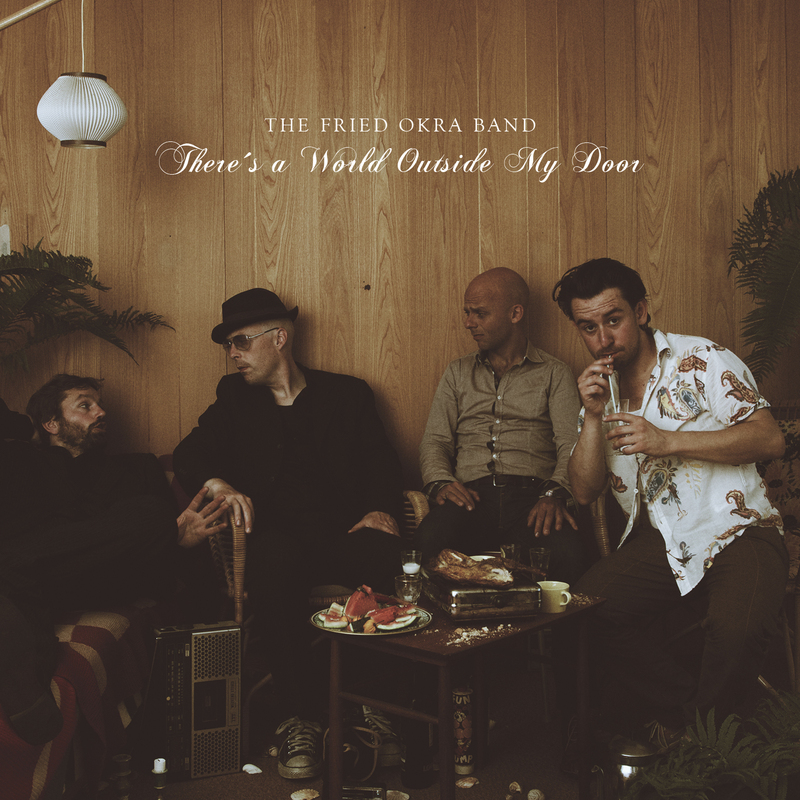 Though the genre got its start in the states, there is certainly no shortage of solid blues albums coming from all corners of the globe, and you will find that The Fried Okra Band out of Europe definitely cuts the mustard with their new release, There’s a World Outside My Door! The Fried Okra Band is based out of Copenhagen, Denmark, and they have been honing their craft since 2003 by playing shows around Denmark and Finland, as well as taking up residency at the Mojo Blues Bar in Copenhagen. There’s a World Outside My Door is their third release, and their second of all original material. Morten Lunn wrote all 12 of the songs and provides vocals, guitar, and diddley bo for this album. Other members of the band include Thomas Foldberg on guitar and harmonica, Thomas Crawford on drums, percussion and mandolin and Henrik Silver on sousaphone and piano. This self-produced CD was recorded and mixed by Crawford and Foldberg at locations around Denmark, and these two gentlemen were able to capture the essence of the band, which can be smooth and ethereal or raw and gritty. The band calls it “Northern Flat Land Blues” and they get this unique sound by eschewing the bass and focusing on vocals, two guitars and drums, with a few instruments used as needed to fine-tune their tone. The listener gets a taste of this right from the first track, “Chicago Stage.” This song has the blues sound and lyrics down, but uses a spooky syncopated guitar ostinato to set the mood and the overall product is more laid-back vibe than most band would have the guts to kick off their album with. It works in this case, drawing the listener into the lyrics which are quite visual as they paint a picture of the pride that only a lead singer can have. It should be pointed out that though these guys are Danish they have worked extensively with the words of their songs so that there are just a few awkward half-English phrases that are well-masked by the poetic structure of the lyrics. Also, Morten sings with a light hill country twang, so there is no hint that these guys are from overseas. The diddley bo is featured on “One String Love” a song that captures the southern roots sound perfectly. Thee unique sound of this single-string instrument is overlaid with mandolin, guitars and only the barest amount of percussion. Foldberg contributes a sweet harmonica break midway through, and his smooth technique works well with Lunn’s subdued vocals. The band’s songs are not limited to usual blues subjects of failed relationships and problems with the bottle. They examine growing older in one’s hometown (“Shopkeeper”), and dive into the deep end of the fantasy pool with “Copenhagen Coppola.” This descriptive dream sequence is set against a sparse backdrop of a few spooky guitars and synths that is punctuated by a single harmonica riff at the very end. This is a powerful tune, and is a fitting way to bring the album to a close. With There’s a World Outside My Door, The Fried Okra Band has set the bar high by writing a dozen solid original songs and recording them with a sound that is all their own. This CD is a keeper, and if they maintain this momentum their fourth release should be astounding!